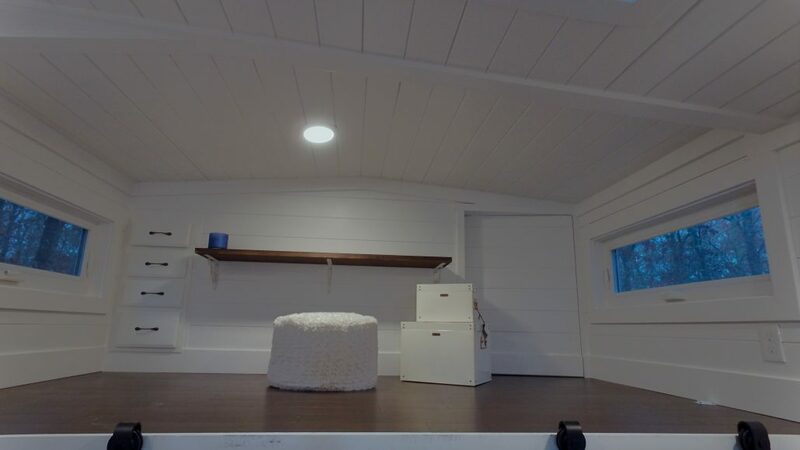 I put off this post for months – an update on my tiny house adventure – because I was working hard to make the house perfect for me. I built a massive deck (it’s almost as big as the house), installed a custom-built book case & media center and turned one of the two lofts into a work space. With all that work done, I love it. I love the house and I love living in it. And yet, I’m selling it. More accurately, it’s for sale. Yup, I’m finally sharing pictures at the same time I’m letting the whole world know that it’s on the market! It breaks my heart a little to say that – I don’t want to sell it – but I fell in love with a property on Cape Cod, I put in an offer and it was accepted! This property will be a huge responsibility and it feels like a big risk but it’s the kind of risk I want to take. It will allow me to have a full office (separate from the house), a small orchard, a lot of land and so much more. I’ve dreamed about having an office close to home but not in my home – a place where I could write my next book, do live videos without concern about lighting & backdrops, and have a more spacious recording studio. This new property will give me that and so much more! I’m a problem solver so the only option in response to fear and stress is to take steps to reduce stress. It’s that simple. I won’t be living in the tiny house once I move and the money will be super helpful in creating my dream property. I’ve been in the tiny house for just under 12 months and I don’t regret a minute of it. Tiny living has changed me in wonderful ways and I highly recommend it, without reservation. I had to get rid of a lot of “stuff” to move into the tiny house – extra kitchen appliances, extra furniture, extra clothes – extra everything! I haven’t missed a single thing. In fact, I still have more than I need! It taught me to simplify and helped me appreciate simplicity. 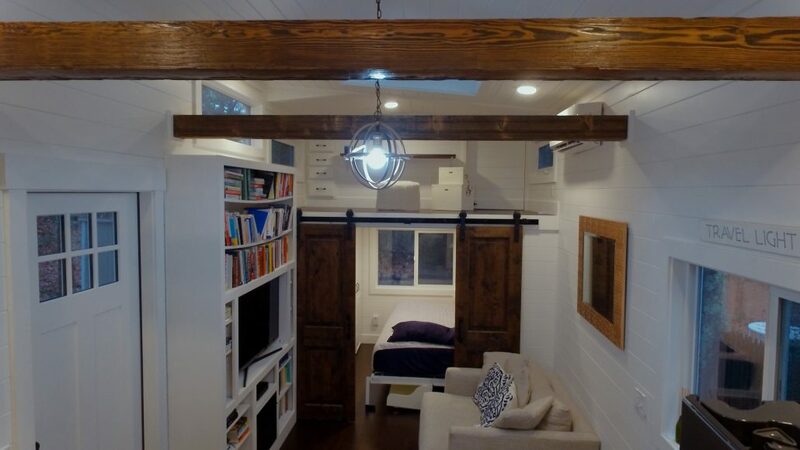 I love everything about the tiny house. It’s a labor of love and I am praying it will find it’s perfect next owner. Maybe that’s you? Maybe it’s your dream income property or a great “guest house” for your grown children or in-laws. I have to believe that the love and money I’ve poured into this house will make someone very, very happy! It has the most beautiful bookcase/media center. It’s huge and I love looking at my massive book collection. It has two sleeping lofts in addition to the main floor master bedroom. I love having a murphy bed! 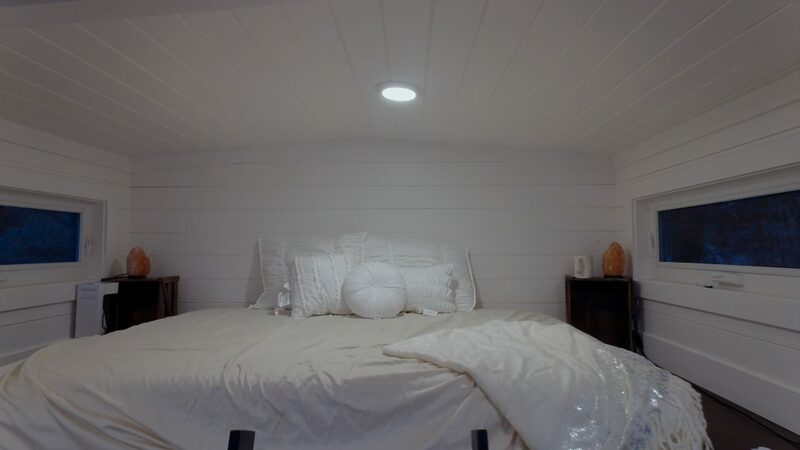 The main floor master bedroom features a murphy bed that folds into the wall and functions as a large desk when it’s not being used for sleeping! Plus, it allows for floor-to-ceiling closets in that room! 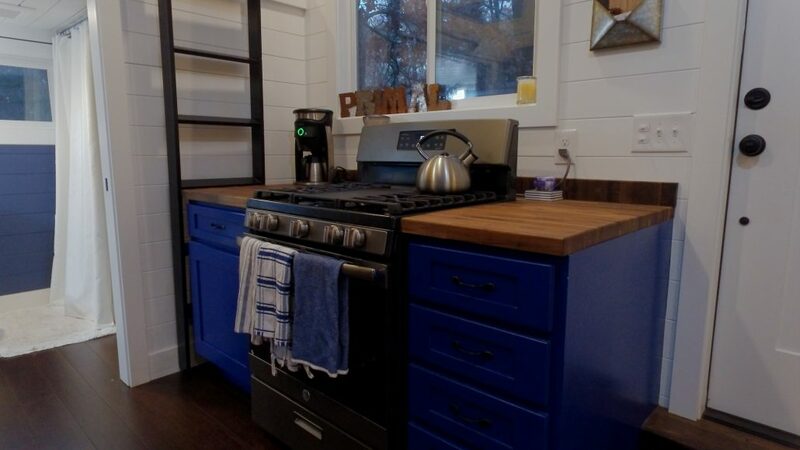 The bright blue cabinets, copper farmhouse sink and butcher block counter tops are gorgeous. The kitchen is perfect and has never once left me feeling crowded. 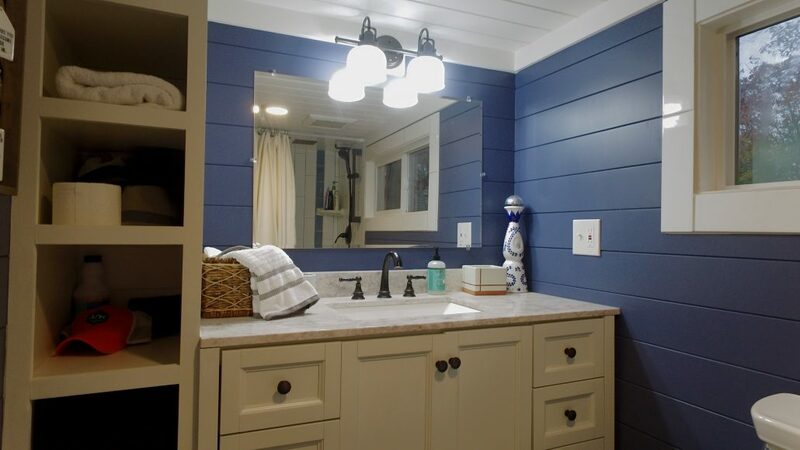 It even has a spacious bathroom with a walk-in shower & rain head, large vanity, storage & laundry. Yes, there’s a decorative tequila bottle in my bathroom. What can I say? Am I selling the land it is on? No. Just the house. How does it get moved? A 3500-series truck can tow it with wide-load permits. For those of you who are like me and have no idea what that means, a 1-ton truck can attach it to it’s trailer hitch and pull it wherever you want to go. Alternatively, you can hire a trucking company to move it, which is what I did when it traveled from Utah to Massachusetts because I don’t even like driving my Jeep. Does it have a real toilet? Yes. When hooked up to septic, it functions just like a regular toilet. How much does it cost? If you’re actually serious about wanting to buy a tiny house, email me for pricing information. If you’re just curious with no serious interest in buying, please do not email – I really appreciate you respecting my time and seriousness about selling this precious home. I’m so happy for you! A property with land and the house of your dreams that fits those dreams for today and tomorrow is a huge gift; and well deserved. I just want to tell you that I love reading your inspiring Sunday messages. Your practical approach to life resonates with me 100%! I am very happy for you that you are on such an amazing path! Keep it up! PS your tiny house is adorable! I’m sure it’ll sell in a heartbeat! Huge congrats, EB – you are such an example of “rising strong” to us all!! I’m so happy for you! I can’t wait to see pics of your new place- that sounds like my dream property also!!! I am so very excited to watch you bloom in your next wonderful adventure. Congratulations.